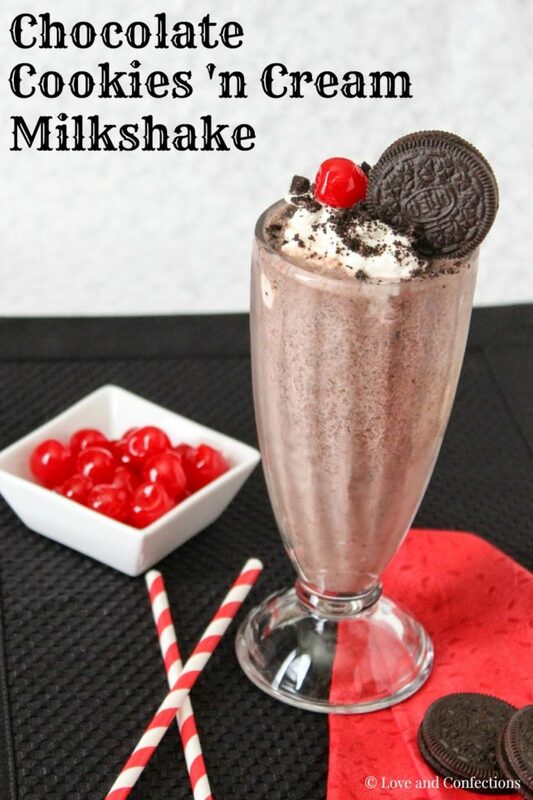 Chocolate Cookies ‘n Cream Milkshake is a chocolate lover’s dream and easy to whip up for an afternoon treat or decadent dessert. Like I said yesterday, I am definitely a Vanilla Bean Ice Cream girl, but once in a while I treat myself to chocolate on top of chocolate on top of chocolate. This milkshake definitely satisfied my chocolate craving. Cookies ‘n Cream is such a classic flavor and I decided to switch it up by using chocolate ice cream too. You can use store bought ice cream or make your own, whichever you prefer. Mr. L&C loves his cookies ‘n cream flavor. He usually picks that out when we buy ice cream. I can’t wait until Baby L&C can be able to try ice cream. I love the joy it brings to kids and seeing their eyes light up when a sundae or ice cream cone is given to them, and then they can’t eat it fast enough and it melts all over them. Total messy cuteness. 1. Place Cookies ‘n Cream Ice Cream, Chocolate Ice Cream and Chocolate Milk in blender and mix until combined. Either by hand, in the bowl of a stand mixer, or with an immersion blender, whip the Heavy Cream and Powdered Sugar until stiff. Crush Chocolate Wafer Cookies into crumbs and pieces. 2. 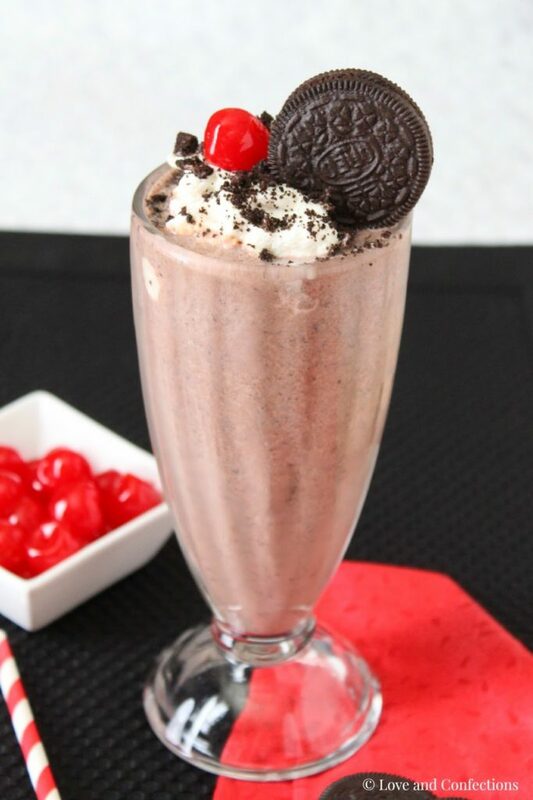 Pour Milkshake into 2 glasses, top with Whipped Cream, Maraschino Cherries and Cookie Crumbs. Enjoy! I'm with you, Terri, on the vanilla bean, but sometimes a girl has just got to have her chocolate fix! 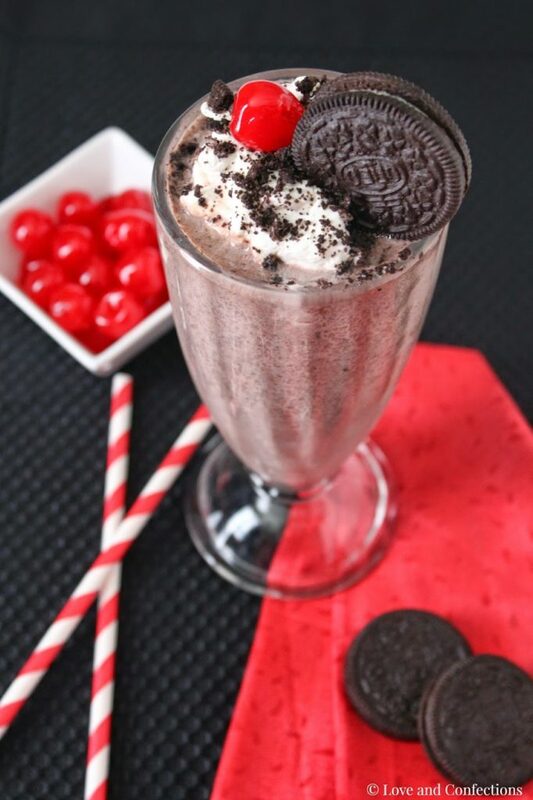 Your cookies and cream milkshake looks so creamy and delicious – yummmm. That is one lucky little girl you have! She is going to be smiling all the time with goodies like this!! Thanks Marion. I can't wait! My daughter would go crazy for this milkshake! Looks so delicious! Thanks Renee. It was so good! Ironically I just made cookies and cream ice cream last night! Guess I know what I'm doing with it! Hope you got to make a delicious milkshake! A milkshake is such a yummy treat and yours looks amazing. My daughter would go nuts for this!! Who wouldn't get all moony about a milk shake like this one. YUM! My kids would go crazy for this combination! It's a little different than just the plain cookies 'n cream which is what i love about it. 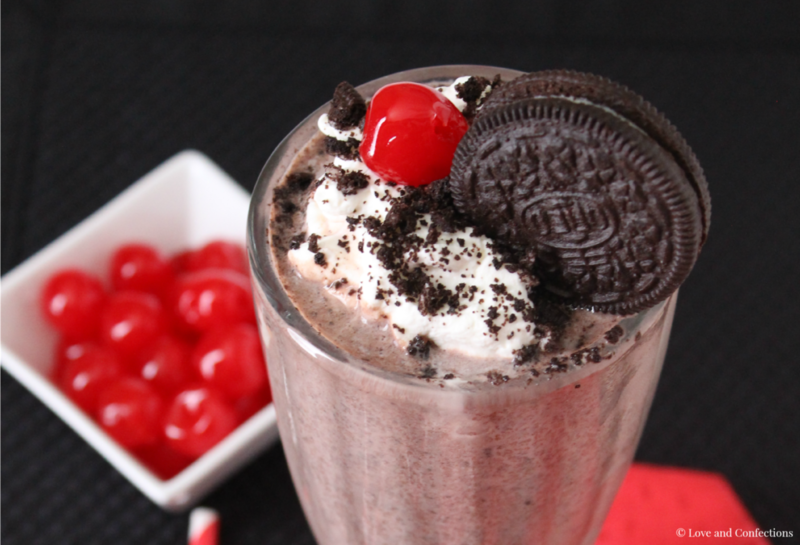 Totally craving a cookies and cream milkshake right now.. this looks so wickedly delicious. Pinned! Thanks Thalia. It was absolutely delicious!